Ah … a span of time without anchors. A day off from work! No chores at home either (leaky faucets, doors not plumb within frames, unsightly detritus on the premises). Spouse off to her job ’til the dark evening hours, weather not too hot nor too muddy nor too frigid to be outdoors. Time to go ramble, with the dogs. We (well, the dogs have little choice, they bark and lean over the sides and sometimes poop in the back of the truck) drive a short distance from the house. I go to trailheads where the likelihood of encountering others is slim, partly ’cause that’s the way I like it, and the dogs need time to be free-spirited unleashed beasts without boundaries. Reducing the possibility of bothering karmically-challenged people who worry about strange dogs intruding into their sacred spatial arenas. The buttheads. I used to make wombats. I don’t know why I ever embarked on this pastime, nor do I remember my first wombat. 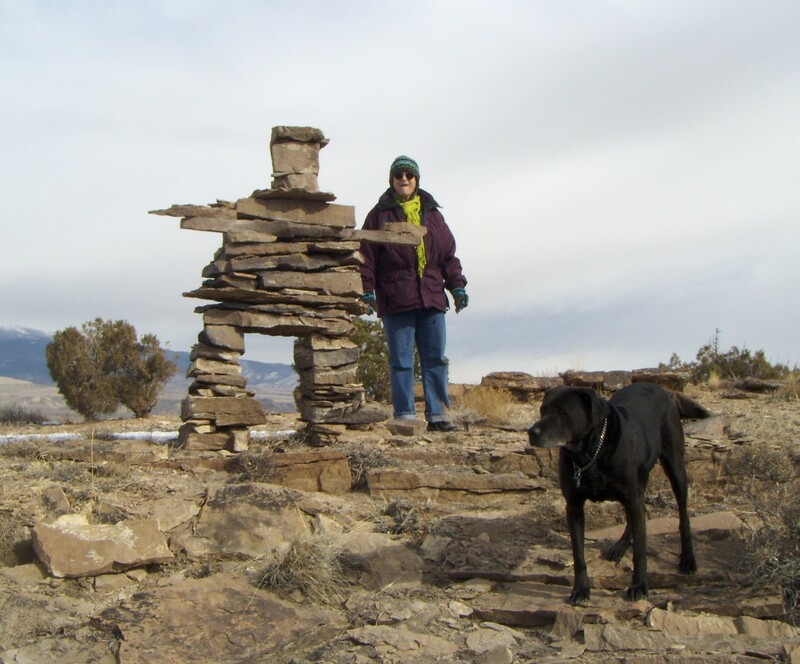 A back-country dog-hike was not ‘good’ until I found a spot to spell out “W O M B A T.” (In rocks. on the ground.) The less likely anyone will ever see it, the better. 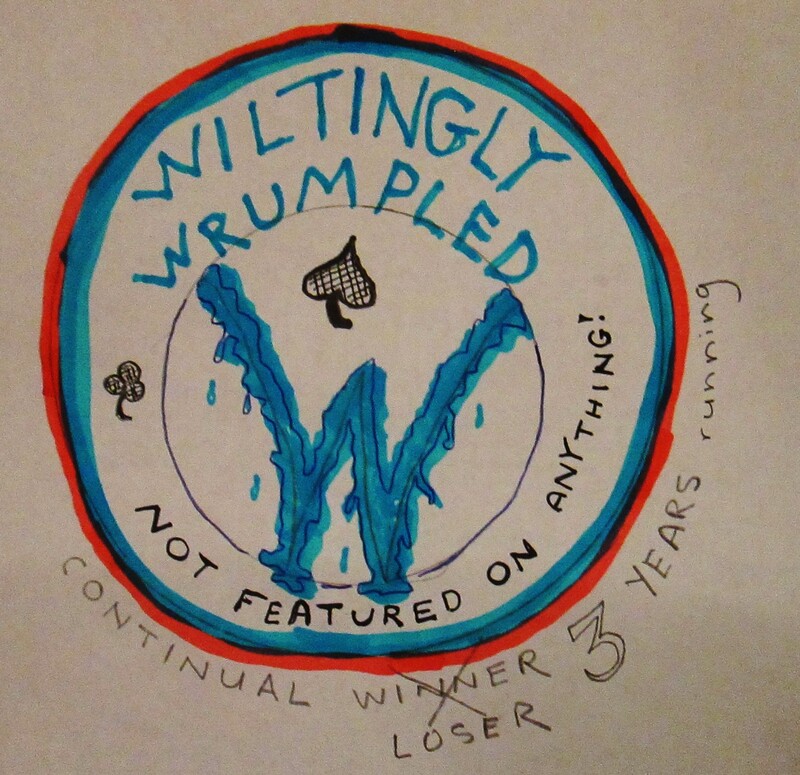 Now wombats are on the back burner. 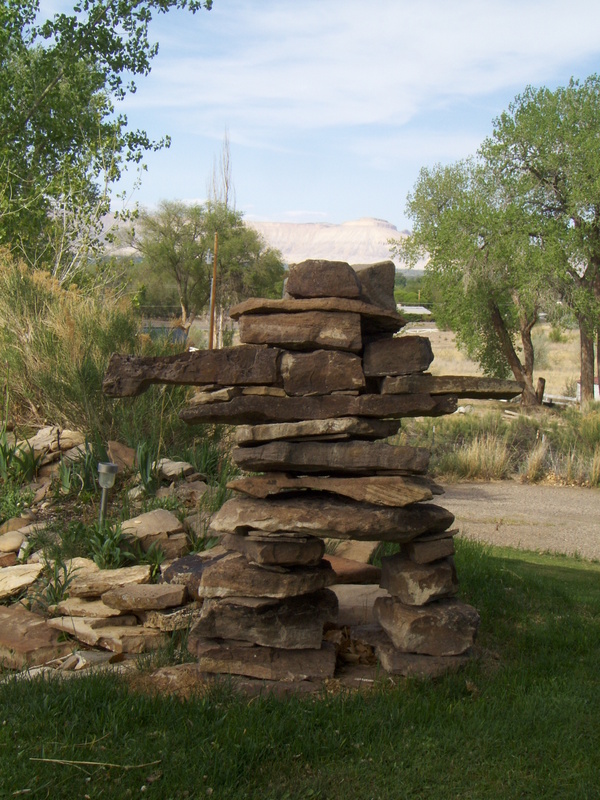 I had been considering, experimenting, constructing ‘test’ inuksuk, or inunnguaq (if one wants to get technical as that is the human form of the Inuit cairn-expression). And about two weeks ago the muse, or the subterranean intradimensional influences, or the mental/psychic/emotional equivalent of a long-overdue quasi-artistic urge, manifested in an inuk manner. 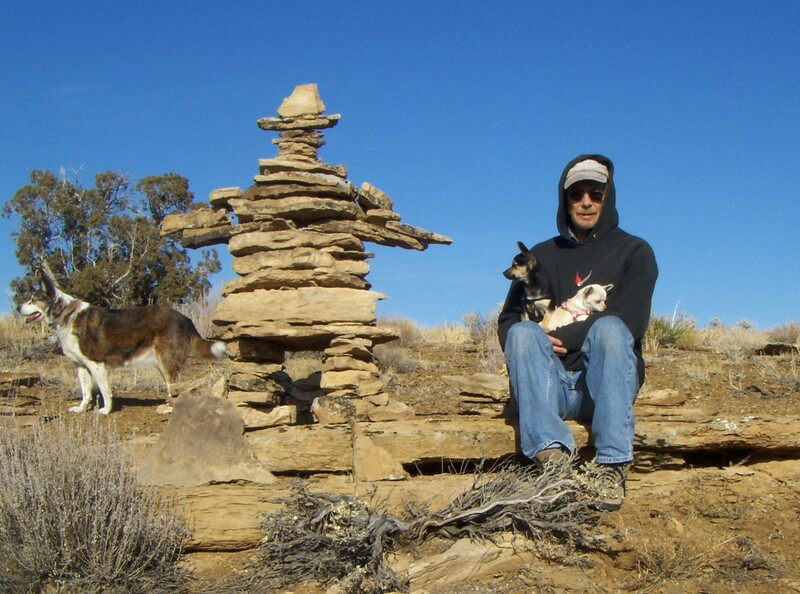 I found the spot, the materials were available, an inuksuk assembled itself … with some help from me. The dogs just wandered around sniffing and digging and occasionally checking on me and then wandering off again. So we wander. I have a general area in mind. A ridge beyond where even I occasionally sojourn. Perhaps the ridge after that. It just depends — on the so-called muse, and, of course, the muse would take a good location and decent construction materials into account. We cruise up the trail, and where it turns to continue up the ridge just north of Highway 141, we don’t. Zigzagging down across the next valley and up the slope to the next ridge. 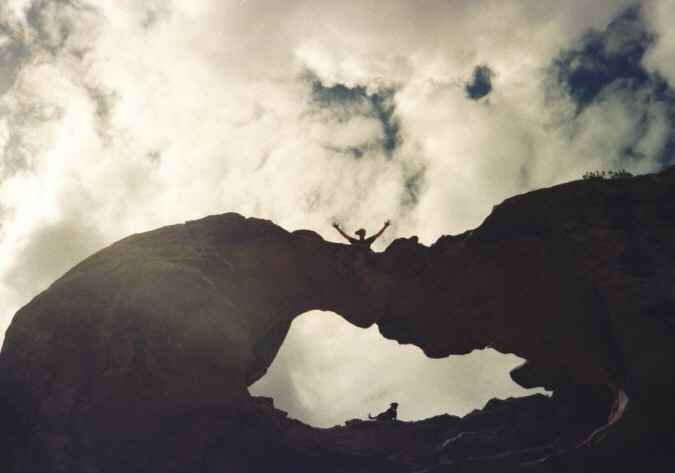 Then down, and up the next ridge and we’ll proceed with the muse-gates more receptive and open on the other side. Pale out of the picture, the horizon looks as it probably did a few hundred, nay, a couple, three thousand years ago. The circum-polar landmark potential beckons. Dogzeneye survey the ridge-top we’re on. The inuk-spot location optimization does not exactly call out for action. The dogs become pre-occupied with pee-mail nexuses and bones to chew on, olfactory delights. I decide that a rock ledge half-way up from the valley bottom to the top of the next ridge north is our candidate location. But it is not. There comes a time when the line in the sand has to be drawn, and attaining the 5th or 6th (it’s easy for me to lose track) ridge-top north of Highway 141 will either be THE SPOT and if not, we’ll back-track to one of the more-promising locations considered earlier. It is breezy, nay, windy on this ridge. The approaching winter storm is stalled a few miles to the west. inunnguaq creation by following a process I initiated a couple weeks before. Gather material, pile it around ground zero. Choose big blocky chunks for the feet. These have to be stable! Take care that the leg-pieces are also flat and preferably square-ish. You will need a couple or more large flat ‘body’ pieces to rest on the legs — and not of the inferior quality sandstone which would break to pieces if you dropped it from waist-high. Be sure there are several thin small pieces for shims and ‘chinking.’ Take care to locate strong and long rectangular rocks for the arms. Enough solid preferably cubic blocks for the upper body and to weigh down the shoulders. A collar-bone section, upon which the neck pieces and, finally, the head can securely rest. Periodically, rock the structure-in-progress gently with one hand and note where shims or ‘chink’ pieces should be inserted to dampen sway. You do want this to withstand a windstorm, not to mention death by bird-perch. 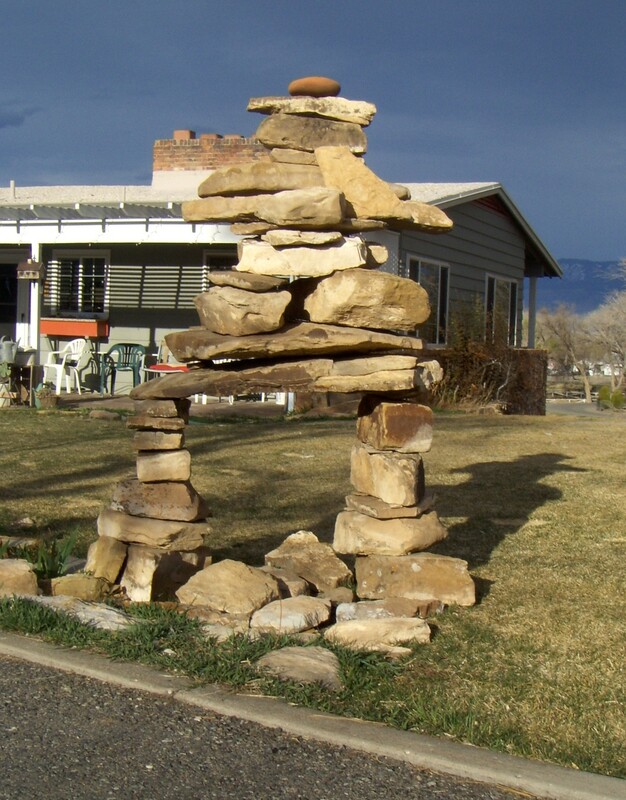 Granted, if a cow were to bump into it … I’d need either a half-dozen labor crew and/or construction machinery to make an inuksuk that large! The dogs have little or nothing nearby in the olfactory delight availability, maybe the wind or impending storm has them apprehensive, and they are glad to leave. I do not exactly backtrack, and make this a circular, not out-and-back, wandering. I’m not tired, the dogs are more energetic than I, there is yet another cigar and the brandy flask has heft. Unlikely, but perhaps my diet of recent has been mostly comprised of souls. No wonder my seemingly sedate existence is paralleled by the great peril a millimeter away. 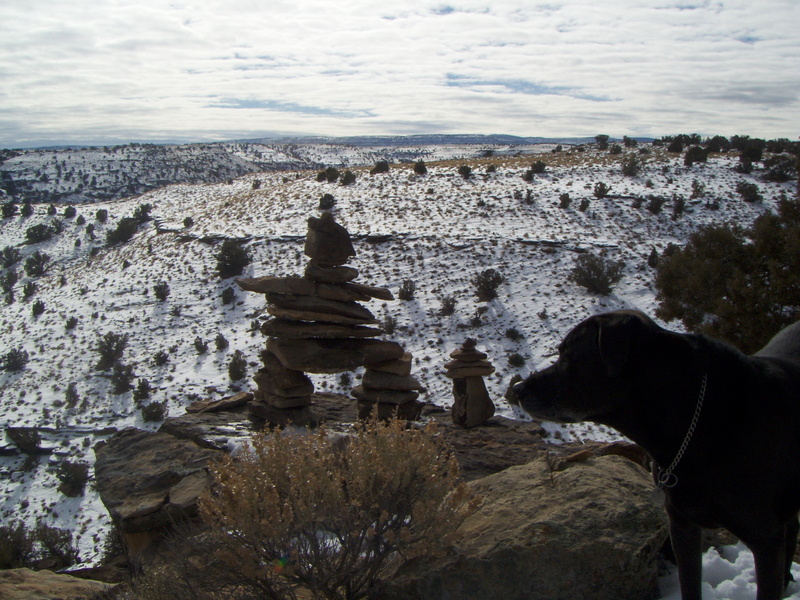 So I build a smaller inuksuk up but across the valley from the ridge-top one. Later on, I spell out a ‘wombat’ on a windswept hilltop much closer to the car. SUBSCRIBE! for free! (i think). follow me following what could be the YELLOWbrikkROAD. ¿ Click HERE -- dog or catma?! i gave up (but in my case, it was 'down') a long time ago. however, several times a day i "try" something, and continue to "look forward' (usually to beer). this blo(r)g is … (in)FAMOUS !